I could list all the reasons FOR decorating, but I really just want to share her new room. 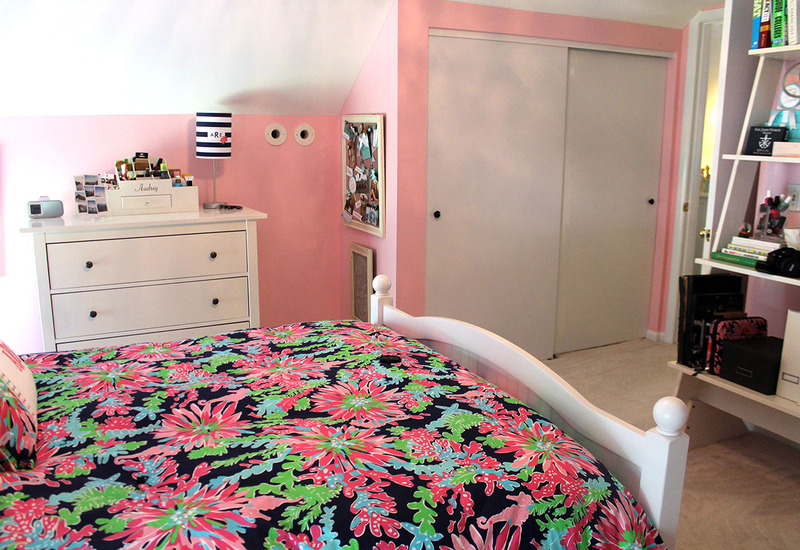 Her new bedroom reflects her style…preppy, lots of monograms, stylish, simple, and youthful. We started by choosing this fun bedding with shades of pink, navy, and green. Then it was decided that the walls should be painted one of the shades of pink. 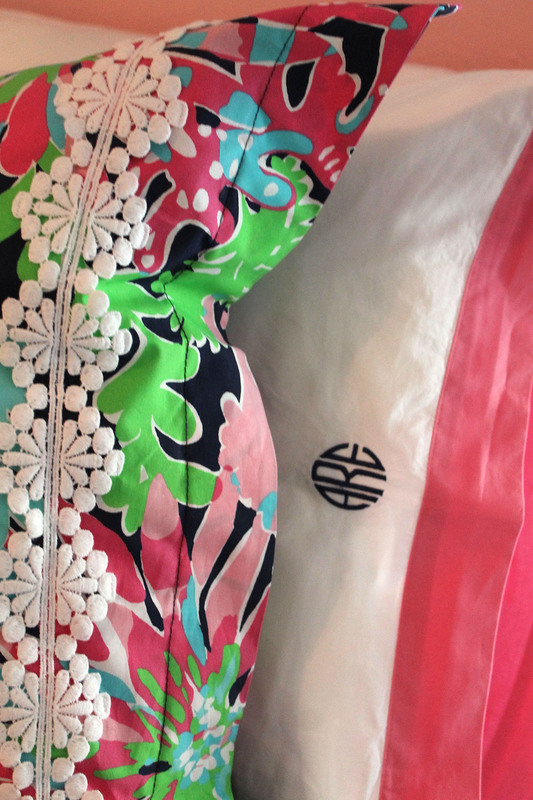 She loves anything with a monogram, so we added a “few” of those to the room. 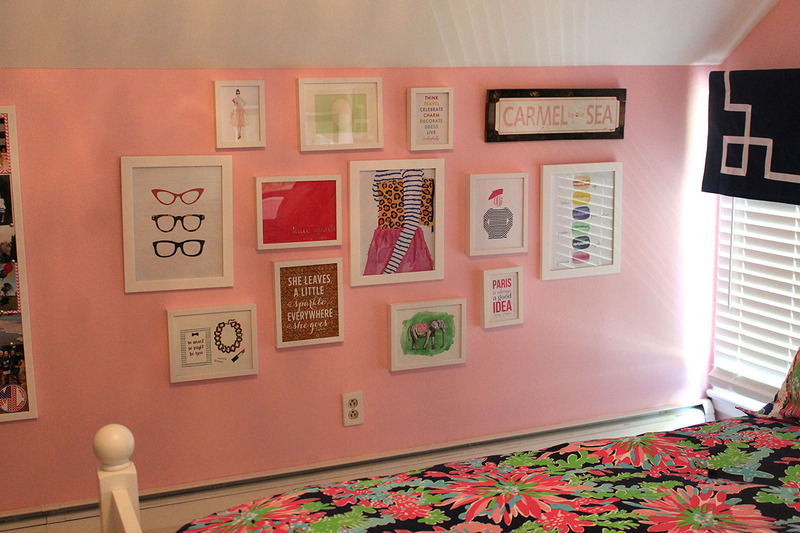 The first thing you see as you enter the room is the large wooden cut-out of her initials hanging above her bed. Side thought…I never realized her initials would actually spell a word (ARE) when I named her. Well, at least it doesn’t spell anything bad! We found this darling lamp that could be personalized with her initials…who knew lamps were available with monograms! I love the small flower detail that picks up the floral print of the bedding. And what about this adorable trashcan with a monogram…it makes taking out the trash a little more fun! 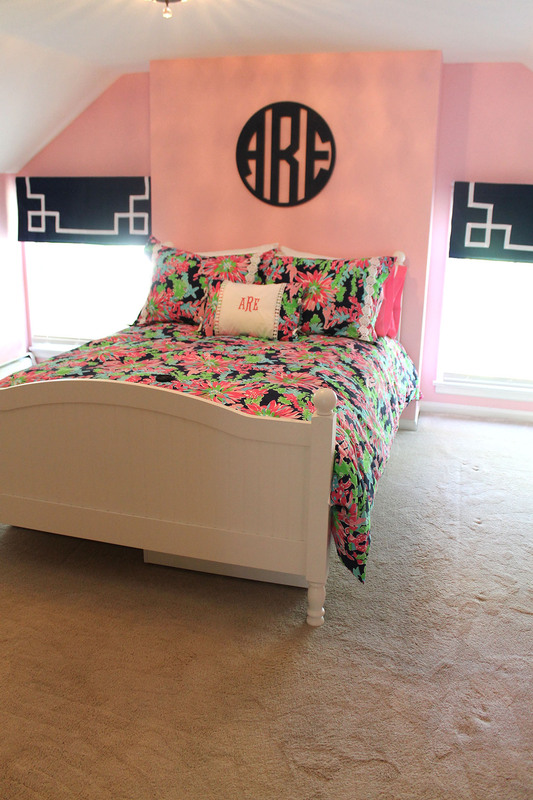 A few more monograms on her bed…pillowcases and a lumbar pillow sham…and we know who lives in this room! With all the patterns, we wanted to keep the window treatments simple. These navy blue valances are perfect! I reupholstered her desk chair with the same fabric as her bedding. 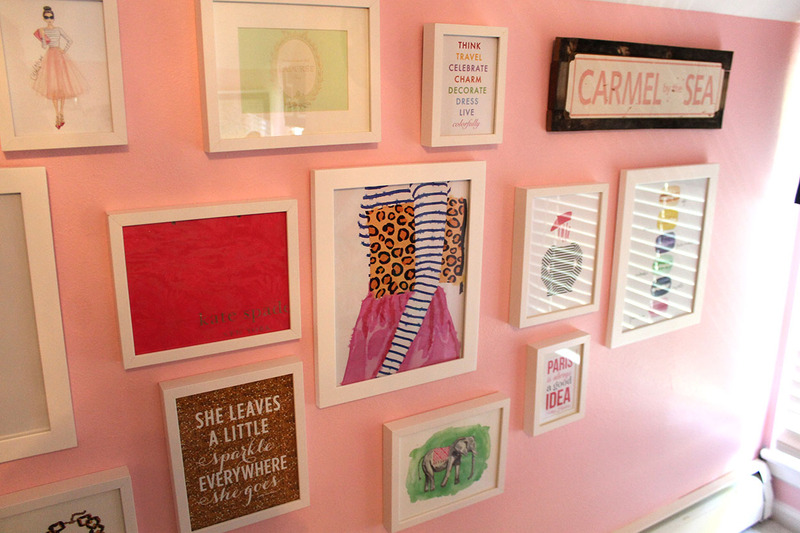 Once the basics were decided, she had a fun idea for one of the walls in her room. 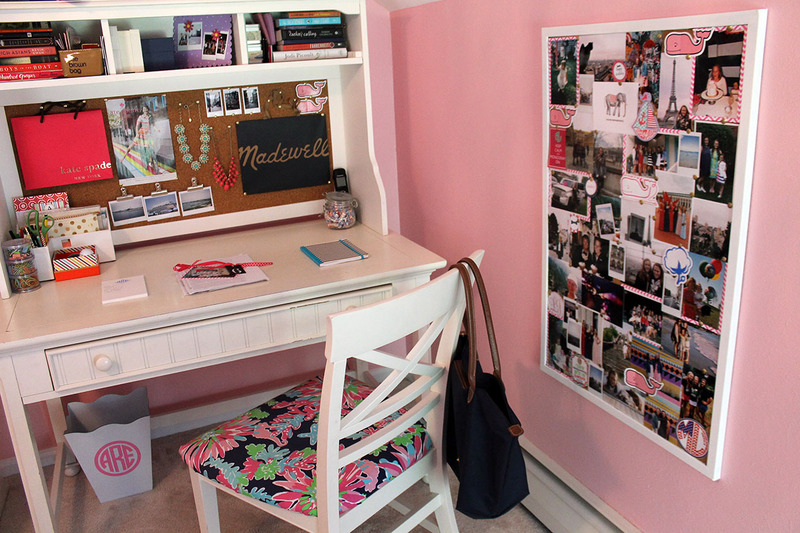 She decorated it with lots of fun prints…all very preppy and simple in style. Something functional that we did during this redecoration was add these underbed storage containers to her room. They are great…made of wood, snap on covers to keep the contents clean, and best of all, they are on wheels for easy access. Maybe with a “new” room that she loves, she’ll come home to visit more often next year! NOTE…click on the pink words above for more information about the various products. 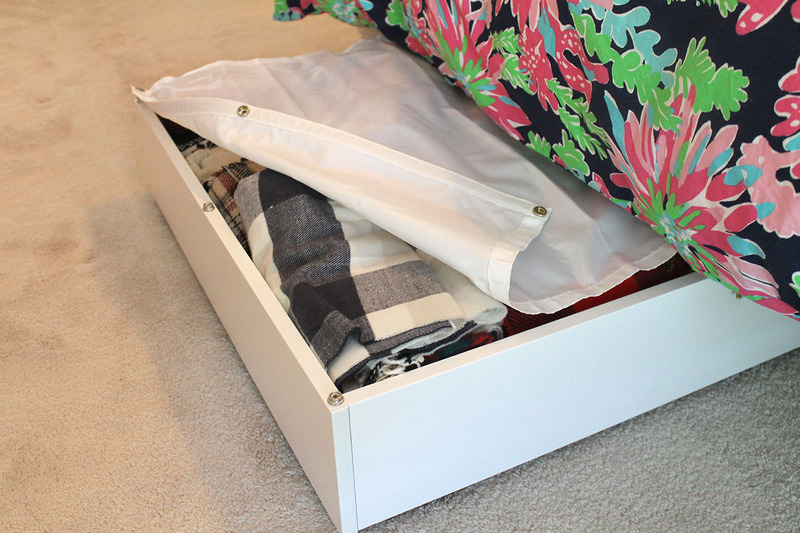 Those underbed storage boxes made a huge difference because her old bed had built-in trundle drawers. And with an old house, we don’t have a lot of closet space. It gives her more storage space than before, and they don’t look bad under her bed. Lovely! Thank you for letting us know where to get an item! Always happy to help people shop! Great room for a pre-adult. I also redecorated my daughter’s room about a year before she left for school. Since then I have redecorated 3 dorms/apartments with her. So much fun but we really have to stop. It’s becoming an expensive addiction. We sound like kindred spirits…I love to decorate!